The holiday shopping season is in full swing, and plenty of pet lovers put the dog or cat on Santa’s list. Here are great gift ideas for the furry family member in your life. Connected fitness tech has been hot this year, and we’ve covered tons of it — so it’s hardly a surprise that a Fitbit-like device is now available for dogs. 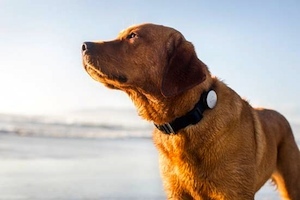 Whistle is a small wireless device that attaches to your dog’s collar to measure activity over time, tracking how much walking, playing or resting your pet does. Let family members or dog walkers pair the Whistle iPhone app to the device using Bluetooth Low Energy, so you can see who’s playing with or walking your dog. The app also communicates how far your dog has progressed toward reaching fitness goals and lets you share information with others such as your vet. If you have cat, you know the irresistible lure of bright objects and balls that roll under couches to be swatted at. 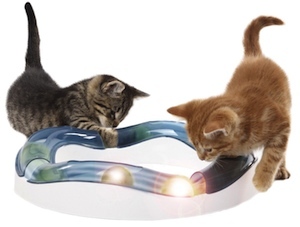 The Catit Design Senses Speed Circuit is the best of both worlds for your feline friend's need to chase shiny objects. The tracks are elevated for extra fun and additional ones can be purchased if you have multiple cats or just want to add more variety. If you like to hit the road at dawn or dusk, you and your dog will enjoy greater visibility with the Nite Ize Nite Dawg LED pet leash. 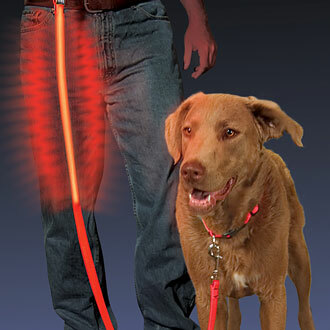 The five-foot leash has an 18-inch highly visible strip of LEDs that run for 75 hours in glow mode or 100 hours in flash mode. Runs on two replaceable button batteries. Want to improve your relationship with your dog? Give the gift of an online subscription to your pooch with Dognition, an online community where you play science-based games with your dog, then record how he or she reacts to them. Dognition assesses your dog according to various attributes, including empathy, communication, cunning, memory and reasoning to categorize your pooch into one of nine personality profiles. Dognition aims to give members better insight into how dogs think, which can help them with behavior issues and enable them to be better owners. 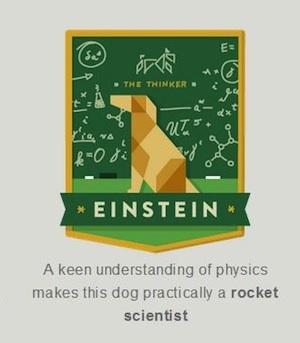 As a citizen scientist project, it uses aggregated data from thousands of members to learn more about dogs and share its findings within and outside the community. The basic fee allows you to play games and get a report on one dog; monthly and yearly memberships let you add games and analysis and receive tailored training tips. Other pet gadgets available for preorder don’t start shipping until 2014, so you won't be able to put them under the tree this holiday season. Even so, you and your pet might find them worth waiting for. 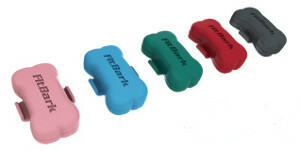 FitBark is similar to Whistle but a bit cheaper. The small, bone-shaped sensor clips to a collar and uploads data about your dog’s activity whenever the device is in range of your smartphone or a small base station similar to a router. The FitBark system can also pull in data from your Nike FuelBand, Fitbit, Withings Pulse or Bodymedia Fit account to show side by side how well both pet and owner are doing in terms of reaching activity goals. So far, FitBark works with a handful of Bluetooth 4.0-enabled phones including the iPhone 4s/5/5c/5s, iPad 3, iPad mini, iPod touch fifth generation and Samsung Galaxy S3/S4/Note II/III/10.1. 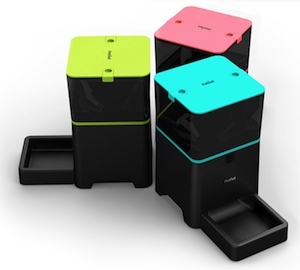 Another tracker worth checking out is the Petnet SmartFeeder, a smartphone-connected pet feeder you can use to remotely control your pet’s feeding, change feeding schedules and portions. You can also see how much food remains in the bin and how your pet’s calorie intake over time compares with others of a similar type and age. You can even set up SmartFeeder to automatically order more food at the right time. A SmartFeeder app will be available for iOS, but if you’re on Android or Windows Phone, you can access the SmartFeeder platform through your mobile web browser. Miss your cat while you're away at work or out of town? Petcube is a sleek-looking box that works with a mobile app to let you play with your cat when you’re away from home. The device houses a laser pointer you can control remotely to entertain your feline, plus a microphone and speaker so you can hear and talk to your cat. There's also a wide-angle camera that can take photos and HD video you can save and share with others. 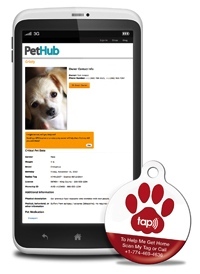 You can even give friends and family access to the system so they can interact with your cat. 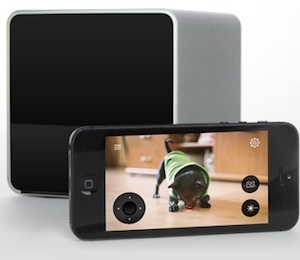 The Petcube will begin shipping in May 2014.